The Accu-Cut® SRM™ 200 Rotary Microtome is designed to work with the Accu-Edge® Blade System to offer unparalleled performance. This manual microtome features a smooth-running hand-wheel helps minimize stress on the operator's hands and optimize both efficiency and productivity, three-axis specimen orientation, specimen retraction, lateral displacement of the Blade Holder and trimming functions. The SRM™ 200 was designed with blade compatibility in mind, maximizing the performance of the Accu-Edge Blades. The universal cassette clamp ensures that the specimen block is held securely in place, while the orienting clamp allows the user to precisely position the specimen surface to the blade. Specimen retraction not only protects the specimen surface, it helps ensure that the microtome blade remains sharp and effective. A trimming lever allows the user to advance the specimen 10 or 50 microns to facilitate accurate and fast trimming of the specimen block. The micron thickness setting is an adjustable visual display, which ensures accuracy with each rotation of the handwheel. For ease of use, the handwheel brake engages in any position. For added convenience and safety, the Universal Blade Holder base has a lateral displacement feature. This allows the operator to utilize the full length of the microtome blade without having to release the blade clamping mechanism or directly manipulate the blade. Accessories included for use with low- and high-profile. Tissue-Tek® Film® Coverslipper is designed to automate the manual task of permanently mounting a histology or cytology stained slide. The Film® Coverslipper has the ability to link with Prisma Slide Stainer which makes this instrument a fully integrated system offering complete walk away convenience. Coverslips up to twenty slides per minute with a cellulose tri-acetate film coated with a xylene-activated resin on the lower surface. The flexible film, with optical clarity equal to glass, is automatically applied to the slide, eliminating the use of sticky mounting media and extended xylene contact. Selectable mounted film length and batch or single slide operating capabilities. Link System (6134) – The Link System combines the Prisma® and the Film® into one fully integrated system offering complete walk away convenience. The Link performs an automatic robotic transfer of slide basket from stainer to coverslipper. Solvent Bottle (4745) – 500 ml glass bottle holds xylene for use in the Film™ Coverslipper. Solvent Bottle Caps (4746) – The xylene bottle cap is positioned on the xylene bottle to prevent excess fumes. The cap is designed with a hole to fit into the xylene dispensing area. Waste Bottle (4748) – 200 ml glass bottle used to collect excessive xylene drained from the dispensing area of the Film® Coverslipper. Waste Bottle Cap (4749) – The Waste Bottle Cap is positioned on the waste bottle to prevent excess fumes. The cap is designed with a hole to fit into the waste area. Exhaust Duct Adapter (4750 & 4751) – The Tissue-Tek® Film® Coverslipper offers an optional Duct Connection Adapter which connects to an external exhaust system, for added protection. Two sizes are available, 38 mm and 75 mm. Stainer & Coverslipper Slide Basket (4768) – Basket for Tissue-Tek® Stainers and Coverslipper for use with the Film® and SCA™ Coverslippers, the Prisma®, DRS-601™ Histology/Cytology Slide Stainers and the RSG-61™ Hematology Slide Stainer. The special basket design reduces cross contamination and carry-over. The basket can also be used in a microwave oven. The slide baskets are available in case quantity. Coverslipping Film (4770) – Cellulose tri-acetate film coated with a xylene-activated resin on the lower surface. The flexible film, with optical clarity compatible to glass, is automatically applied to the slide, eliminating the use of sticky mounting media and extended expose to xylene. Selectable mounted film length and batch or single-slide operating capabilities. The Film is available 5 rolls per case, each roll can coverslip 1,000 slides. Coverslipper Film Cutter Blades (4772) – Blades are used inside the Film® Coverslipper to preciously cut each roll of film to the precise dimensions of the slide. The Coverslipper Film Cutter Blades are available 5 blades per case. Fume Filter (6160) – The fume filter for the Film® Coverslipper is sufficient in removing fumes that are generated during routine use. It is recommended that the filter be replaced once a month. Fume Filter s are packaged 2 to a case. Activated Carbon Filter Block (4775) – Activated Carbon Filter Block for use with Tissue-Tek® SCA™ Coverslipper Fume Controller. This Filter Block is easily installed to provide fume filtration during operation, coverslipping 5,000 slides. Introducing Tissue-Tek® Glas™ g2 – the premier automated glass coverslipper that link to the Tissue-Tek® Prisma® Stainer to provide a true walkaway system. 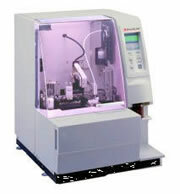 The Tissue-Tek® Glas Coverslipper is a state-of-the-art instrument automated coverslipping procedures to a new level. With a throughput of up to 400 slides per hour, the Tissue-Tek® Coverslipper provides clean bubbles-free slides fast and consistently. The flexibility design accommodates both histology and cytology specimens. Mounting medium volume is easily and adjustable for all type of specimens. Coverglass size 40, 50, 55 and 60 mm can be changed easily and the speed of coverslipping can be modified for specimens more difficult to coverslip. This Coverslipper is enabled to be used with xylene or xylene substitutes. Tissue-Tek® Glas™ Mounting Medium is designed specially to be used on the Glas™ Coverslipper to maximize performance, producing clean, bubble-free slides. This xylene-based mounting medium is medium viscosity and can be opened and placed directly onto the mounting medium area of the coverslipper, no pouring needed. Each 16 oz bottle coverslips up to 10,000 slides. Link System combines the Prisma® Stainer and the Glas™ g2 into one fully integrated system offering complete walk away convenience. Is designed specially to be used on the Glas™ Coverslipper to maximize performance, producing clean, bubble-free slides. This xylene-based mounting medium is medium viscosity and can be opened and placed directly onto the mounting medium area of the coverslipper, no pouring needed. Each 16 oz bottle coverslips up to 10,000 slides. Loading Drawer (6421) – This loading drawer for the Tissue-Tek® Glas™ Coverslipper is for holding slides prior to coverslipping. The loading drawer is divided into three sections, accommodating up to three slide basket per section, holding total of 60 slides. Xylene or xylene substitute may be added to the loading drawer to prevent sides from drying out prior to coverslipping. The drawer may be removed from the loading area and covered to prevent evaporation when not in use. Drawer Cover (6422) – The drawer cover is used to cover the Loading Drawer, which helps prevent evaporation of solvent when the instrument is not in use. Nozzle Reservoir (6423) – The nozzle reservoir consists of small plastic bottle and lid which is sealed inside a metal housing. The nozzle reservoir is used for keeping the mounting medium nozzle tip from drying out during use. It should be filled with xylene or a compatible solvent. The mounting medium tip is positioned inside the reservoir when the instrument is in the stand by mode or not in operation. Coverglass Holders (6425, 6426, 6427 & 6428) – The coverglass holders is used for holding coverglass which will be used for application during coverslipping operations. Three standard sizes are available for use on the Glas™ Coverslipper, 40 mm, 50 mm, and 60 mm. Each holder can hold up to 200 coverglasses at one time. These holders are seated on the coverglass stage of the instrument and are removable for ease of loading. Receiving Rack (6429) – This receiving rack is for retrieve slides which have been completed by the coverslipping process. Each metal rack is grooved and capable of holding up to 20 slides. As each slide enters the rack, the rack is advanced to the next position, anticipating receiving the next slide. Racks are easy to remove and replace with the convenient handle. Plastic Waste Tray (6430) – The plastic waste tray is seated in the metal housing next to the nozzle reservoir. The purpose of the waste tray is to collect any mounting medium waste that may be generated during coverslipping operations. The plastic tray is removable and disposable. It should be replaced periodically as necessary. Priming Bottle (6433) – The priming bottle is used only during set up procedure prior to nomal operation of the instrument. The priming bottle has a narrow tube extending from the bottle, which is used to connect to the mounting medium tube located on the instrument. This priming bottle should be filled with xylene and manually pumped through the mounting medium line to remove any trapped air or air bubbles which may be present in the line before operation. Stainer and Coverslipper Slide Basket (4768) – Basket for Tissue-Tek® Stainers and Coverslipper for use with the Film® and SCA™ Coverslippers, the Prisma®, DRS-601™ Histology/Cytology Slide Stainers and the RSG-61™ Hematology Slide Stainer. The special basket design reduces cross contamination and carry-over. The basket can also be used in a microwave oven. The slide baskets are available in case quantity. Suitable for high volume laboratories which do not want to sacrifice quality. The Prisma® has the ability to be linked with the FilmCoverslipper (by use Link System for Connectivity with Prsima® Stainers #62666) which makes this instrument a fully integrated system, offering complete walk away convenience. Continuous loading of baskets enables high throughput and the intelligent loading feature allows Prisma® to handle as many as 360 slides per hour. The Prisma® is compatible with histology and cytology staining protocols. Reagent reservoir configurations allows for simultaneous runs of H & E and special stains. Tissue-Tek® Prisma® Slide Stainer with Special Stains (6131) – The Prisma® complete with all option for use with special stains like PAS, Giems, Mucicarmine stain. Link system for Connectivity with Film® Coverslipper (6134) – The Link System combines the Prisma® and the Film® into one fully integrated system offering complete walk way convenience. The Link performs an automatic robotic transfer of slide baskets from stainer to coverslipper. Link System to Tissue-Tek® Glas g2 Coverslipper (6168) – The Link System combines the Prisma® and the Glas g2 Coverslipper (Tissue-Tek #6500) into one fully integrated system. Stainer and Coverslip Slide Basket (4768) – Basket for Tissue-Tek® Stainers and Coverslipper for use with the Film® and SCA™ Coverslippers, the Prisma®, DRS-601™ Histology/Cytology Slide Stainers and the RSG-61™ Hematology Slide Stainer. The special basket design reduces cross contamination and carry-over. The basket can also be used in a microwave oven. The slide baskets are available in case quantity. 20-Slide Basket Load/Unload Adapter (6135) – The 20-Slide basket load/unload adapter allows users to align the slide baskets in the middle position of the start station when the expanded reservoir are being used. 20-Slide Basket Adapter (6136) – 20-Slide Basket Adapters are to be used in conjunction with the Slide Baskets on the Tissue-Tek® Prisma® Slide Stainer. 10-Slide Basket, Slecial Stain (6137) – Basket for the Tissue-Tek® Plasma® Slide Stainer. For use with the Tissue-Tek® Plasma® Slide Stainer with special stain capability. The basket has a 10 slide capacity and is specifically designed to reduce carry-over and contamination. 10-Slide Basket Adapter (6138) – Slide Basket Adpters are to be used in conjunction with the Slide Baskets on the Tissue-Tek®Plasma® Slide Stainer with Special Stain. 10-Slide Basket Load/Unload Adapter (6139) – The 10-Slide basket load/unload adapter is used with the special stain setup to accommodate the 10-slide basket. When the adapter is placed in a start station the Tissue-Tek® Plasma® recognizes the 10-slide basket and prepares to run it in the special stain mode. Special Stain reservoir 180 ml (6140) – The Special Stain Reservoirs can be combined with the standard or expanded solution configuration. The special stain configuration includes eight solution reservoirs. The special stain reservoirs can accommodate a volume of 160-180 ml of solution. Heated Solution Reservoir 180 ml (6141) – The heated Solution Reservoir works in conjunction with the special stain setup. The two independent heated stations can be programmed to heat special stains to 30-70°C. Special Stain Reservoir Lid (6144) – The Lid for the Special Stain Reservoir is a single lid used to cover the special stain reservoir when not in use. Small Solution Reservoir, 285 ml (6145) – The Small Solution Reservoir can be used with the standard solution reservoir. With the expanded configuration there are a total of 54 stations and are arranged with 6 station in the front row and eight station in the other six rows> The small solution reservoirs can accommodate 255-285 ml of solution. Small Solution Reservoir Lid (6146) – The Lid for the Small Solution Reservoir is a single lid use to cover the small solution reservoirs when not in use. Standard Solution Reservoir, 820 ml (6147)– The Standard configuration of standard solution reservoirs is a total of 30 stations with six stations in the front row and eight stations in the other three rows. The standard reservoir accommodates 680-820 ml of solution. Load/Unload Reservoir, 830 ml (6148) – This is a Standard Solution Reservoirs with handles are placed in the front row of the instrument. These reservoirs have a handle for easy removal and are used as the start/end stations. The reservoir volume is 830 ml. Wash Reservoir, 850 ml (6149) – The Wash Reservoir is a specially designed reservoir to be used exclusively with the Tissue-Tek® Prisma® Slide Stainer that contains openings positioned for maximum water flow. Each reservoir has an 850 ml volume. 820/830 ml Reservoir Lid (6151) – The Lid for the Standard Solution is a single lid used to cover the reservoirs when not in use. 3-Position Reservoir Tray (6152) – The solution reservoirs are arranged in a one level configuration and are positioned in either a 3 or 4-position reservoir tray. These trays can hold multiple solutions to allow for easy placement into and removal from the instrument. The trays are designed to ensure proper orientation when placed into the instrument. 3-Position Reservoir Tray Lid (6153) – This 3-Position Reservoir Tray Lid is a one piece lid to cover all reservoirs located in the 3-position reservoir tray. 4-Position Reservoir Tray (6154) – Same as 3-position reservoir tray but has 4-position. 4-Position Reservoir Tray Lid (6155) – Same as 3-position reservoir tray lid but designed for 4-position reservoir tray. Special Stain Reservoir Tray (6156) – This special stain reservoir tray is a 8-position tray that holds the special stain reservoirs inside the Prisma® Slide Stainer. Fume Filter (6160) – The fume filter for the Tissue-Tek® Film® Coverslipper and Tissue-Tek ® Prisma® Stainer is sufficient in removing fumes that are generated during routine use. It is recommended that the filter be replace once a month. Fume filters are packaged 2 to a case. Start & End Labels (6161) – The station labels are designed to be attached to the Start, End or PE station for reservoir identification. Screen Protection Sheet (6163) – This accessory is for use exclusively with the Tissue-Tek® Prisma® Slide Stainer, to protect the control panel from scratch. Compact Flash Card (6164) – The compact flash card allows data to be transferred to the PC. This accessory is for use exclusively with the Tissue-Tek® Prisma® Slide Stainer. Exhaust Duct Adapters (6165 & 6166) – The Tissue-Tek® Prisma® Slide Stainer offers an optional Duct Connection Adapter which connects to an external exhaust system for added protection. Two sizes are available, 38 mm and 75 mm. The Tissue-Tek Cryo3 Flex Cryostat is the 3rd generation of the established, reliable and trusted Cryo3 platform for fast sectioning of frozen tissue specimens. It was designed to decrease the time to get complete sections, and in parallel to preserve valuable tissue. When cutting frozen sections time is of the essence. The Tissue-Tek Cryo3 Flex Cryostat is the first and only cryostat with a precision 3D chuck for precise, rapid, and complete sectioning, preserving valuable tissue. The Tissue-Tek Cryo3 Flex Cryostat produces superior sections from 1 to 99 µm using a temperature-controlled blade holder and a 3D Precision Chuck to accurately align the block face to the blade, reducing operator's trimming time and preserving specimens. The sturdy chuck retains its position when locked and unlocked, eliminating any time and effort spent realigning the cutting angle. Specimen placement and orientation are easy with the Cryomold technique. Cryo+ area of the Cryobar allows rapid freezing down to -50°C. The Cryomold technique provides uniform specimen block for rapid sectioning. Users can now leverage the newly developed Anti-Roll Rake that was designed to best mimic the preferred and widely accepted "Brush Technique" to prevent sections from rolling, which in addition, reduces the learning curve of new users making them proficient faster. For the first time in the history of cryotomy, the advanced online remote diagnostics technology platform, iSupport, has been successfully integrated into the hardware and software of the Cryo3 Flex. This ensures faster instrument support and maximum uptime. A color touch LCD screen provides a visual display of critical sectioning information, such as current chamber temperature, section thickness, and trimming thickness. The Cryobar offers 12 positions, allowing operators to use the Cryomold method or direct method at the same time. The Cryo+ area of the Cryobar freezes to -50° C, within 5 minutes after activation. The Tissue-Tek Cryo3 Flex D (Disinfection) and DM (Disinfection/Motorized) models offer innovative options like motorized sectioning, ozone disinfection, and a vacuum debris removal system. The Cryo3 now uses a more efficient and patented ozone technology to safely protect operators from pathogens in between weekly decontamination requested by CAP Accreditation Guidelines. The combination of ozone, UV and elevated temperatures provide unprecedented disinfection with a reduction of up to 5 logs for the SV40 virus. Specimen Holder, Small (5807, 5808 & 5809) – Tissue-Tek Cryo3 specimen holders are used for mounting specimens with O.C.T. Compound, which will be frozen for sectioning. Three sizes are available. The small holder can accommodate a specimen size up to 25 mm. In addition, Tissue-Tek Cryomolds, standard and biopsy sizes, can be used to create a uniformly shaped flat surface to aid in trimming and sectioning. An O-ring is positioned around perimeter of the holder for added protection while handling. An etched marking at the base of the post can be used for positioning if the specimen holder is removed from the chuck. Heat Extractor, Standard (5811 & 5815) – This flexible heat extractor is used to aid in rapidly freezing specimens for frozen sectioning technique. The flat side of the heat extractor allows for positioning directly on top of the specimen. Changing the surface orientation allows for the indented side of the extractor to be used with the Cryomold technique. The extractor may be mounted on left side of the chamber, above the cryobar for easy access. 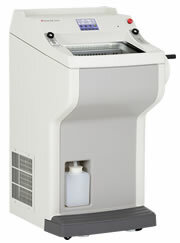 Using the heat extractor greatly reduces the rate of freezing specimens. Cryobar Insert, 4-Post (5820)– These unique inserts enable flexibility in configuring the Cryo3 cryobar the meet the needs of each laboratory. Each insert is easily removed and replaced. The 4-post insert is used to accommodate cryomolds, which can be positioned directly into each well for freezing. Cryomolds create a uniformly-shaped, that surface, which make trimming and sectioning easier and faster. Utility Tray (6213) – This removable utility tray is positioned inside the Cryo chamber to the right of the Microtome. It provides ample space to accommodate miscellaneous items such as OCT Compound, disposable blades, brushes etc. The four holes may be used to store extra specimen holders for future use. Waste Bottle (5825) – This 2-liter waste bottle is a plastic container which is positioned on the lower left front side of the Cryo3 instrument. The waste bottle is responsible for collecting residual moisture and debris generated from the defrost cycle or manual disinfection procedures. Vacuum Filter Set (5826) – This set is used with Cryo3 models 6201 and 6202, consists of a microbial filter, a coarse debris filter and a corrugated vacuum hose. The filter is connected to a port located inside the chamber and the other end is connected to the blade holder port. When the vacuum system is on, debris and unwanted trimmings generated during sectioning are collected and contained in the filter. The filter is disposable and should be removed and replaced every 2 months or as often as necessary. Vacuum Hose attachment (5827) – This vacuum hose attachment is used in conjunction with the vacuum filter set and can be attached to the corrugated vacuum hose, which connects the microbial filter. When the vacuum system is powered on, the hose attachment can be used to remove debris from the base of the chamber or other areas inside the instrument. Tissue-Tek Cryo3 models 6201 & 6202 come standard with the vacuum debris removal system. Ozone Lamp Assembly (5828) – The ozone lamp is responsible for generating ozone inside the chamber for the purpose of automatically disinfecting the cryo chamber. Ozone disinfection is standard in both Cryo3 models, 6201 & 6202. The ozone lamp assembly should be replaced every 1000 cycles. The instrument software provides a reminder message when the useful life is nearing its end. Foot Pedal (5829) – The optional foot pedal is designed to be used for hand-free automated sectioning when using Cryo3 model 6202, which comes standard with motorized sectioning. It can be used to take the place of using the control panel to operate the motorized function of the instrument. The foot pedal is an optional item. Anti Roll Rake (6211) – The newly designed anti-roll rake is a unique anti-roll device mounted above the microtome chuck, which is used to easily and consistently obtain sections from frozen specimen blocks. The grooved edge of the rake attaches to frozen O.C.T., preventing the section from curling to produce a clean flat section to mount on a microscope slide. The anti-roll rake can be easily adjusted by manipulating the back knob located on the left side of the rake. This technique independent method is ideal when using Cryomolds. Anti Roll Plate (6210) – The anti-roll plate is used on the Cryo3 to assist in stopping tissues from rolling while performing microtomy. Steel Knife Holder (5833) – The steel knife holder is an adapter which holds a steel knife in place on the Cryo3. Drain Cleaning Brush (5834) – This device is used to periodically clean the drain hole inside the instrument, located at the bottom left-side of the chamber. The drain is responsible for channeling residual fluid generated from the defrost cycle into the waste bottle. Ozone Port Screen (5835) – The ozone port screen is a small, round mesh screen used to protect the ozone port from debris. It should be placed over the ozone port located at the base of the chamber on the right side. Fluorescent Lamp (5836) – The fluorescent lamp is mounted inside the chamber and is used to light the chamber while sectioning. The light is illuminated each time the chamber window is open. A function key located on the display can be pressed to illuminate or turn off the lamp manually.